David Jaffe was lying to us all: He is working on a new Twisted Metal for the PS3, and it was announced today at E3 2010. When David Jaffe said he "wished" he was working on a new Twisted Metal, that was just clever trickery: He wished he was, and he actually was, too. 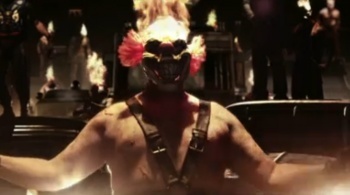 At the Sony E3 '10 press conference, Jaffe took the stage to introduce the new iteration of the PlayStation's "longest-running series," coming in 2011 and developed by members of the original Twisted Metal team. It's got a ton of new stuff: Helicopters, faction vs. faction gameplay (evil clowns headed by Sweet Tooth, vs dolls headed by Dollface), and it just looks brutal. It's also playable at E3, so hopefully we'll get to see it hands-on when we visit the Sony booth. Well played, Jaffe. Well played.